Look Up "[selected-text]". Look up the selected text in the Dictionary app. Search with Google. Open a search got the current text selection via Google in the user's default web browser. Copy. Copy the current selection to the clipboard. Paste. Paste the clipboard contents at the current insertion point. Find. Opens the Find sub-menu. Spelling and Grammar. 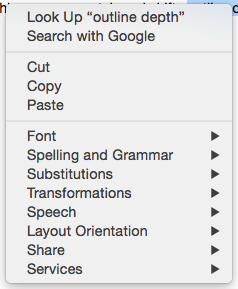 Opens the Spelling and Grammar sub-menu. Substitutions. Opens the Substitutions sub-menu. Transformations. Opens the Transformations sub-menu. Speech. Opens the Speech sub-menu. Layout Orientation. Opens the Layout Orientation sub-menu for text orientation. Share. Opens the Share sub-menu for sharing via social media. Services. Opens a sub-menu listing OS Services pertinent to the current context.